Early this morning, a joint team of special police and forest personnel killed 20 persons allegedly involved in sandalwood smuggling in the Seshachala forests in Chittoor district of Andhra Pradesh. Kantha Rao, deputy inspector general of police, special task force, told Down To Earth that all 20 men were from Tamil Nadu. Of them, two were smugglers and the others were their workers. Rao said the group attacked the police first and the police opened fire in “self-defence”. National daily Times of India says on its website that this is the largest police “encounter” ever reported involving red sanders smugglers. The firing took place in two places, Eetagunta and Vacchinodu Banda, in the forest. 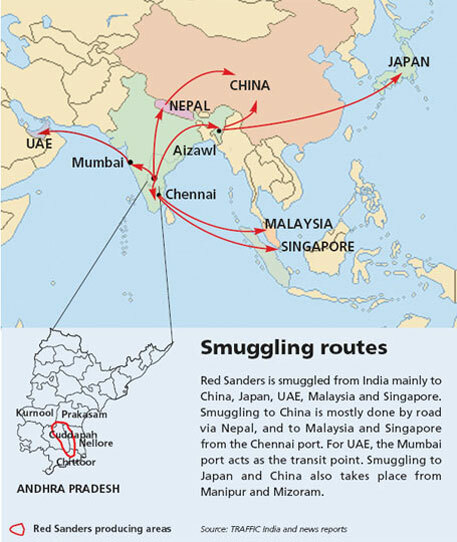 Andhra Pradesh Home Minister Chinna Rajappa said, "Red sanders smuggling is a serious and regular problem in forests on the Andhra Pradesh-Tamil Nadu border, which often leads to law and order issues." Red sander or red sandalwood is an endangered tree species found only in the forests of Chittoor, Kadapa, Nellore and Kurnool districts of Andhra Pradesh. A tonne of red sanders costs more than Rs 25 lakh in the international market. 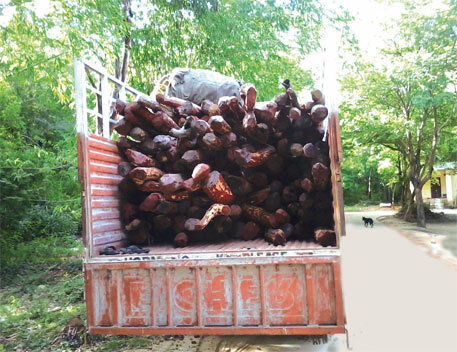 DTE had reported in July last year that red sanders smuggling was a thriving operation in the region and that attacks by smugglers on forest officials had increased in the past few years. Andhra Pradesh decided to auction half its stock of red sanders in the international market. The state had a total stock of 8,550 tonnes seized from smugglers since 2002. "The auction took place and the Andhra Pradesh government earned Rs 2,000 crore," said R Hampiah, former chairperson of the state's biodiversity board. The state board will get five per cent of the amount. It plans to use this money to cultivate red sanders in villages across the state. Despite efforts, Andhra Pradesh has failed to check smuggling. The special task force has arrested more than 3,500 people in over 4,500 cases of red sandalwood smuggling since 2004. An Andhra PradeshÃ”Ã‡Ãªforest official told DTE that most jails in the Rayalaseema region have a high number of redÃ”Ã‡Ãªsanders smugglers. But these arrests have not deterred people from joining the illegal trade as “smuggling red sanders offers high returns without any investment”. This region is drought prone area. With cutting of forest trees on one side by smugglers and on the other side putting fire to forests to encroach forest lands have become a common future. Unless these two activities are contained, there will be a severe problem of reducing the rainfall and occurrence of frequent droughts and thereby lakhs of people animal deaths. Tamil Nadu government, unfortunately, raises the killing aspect but not what will happen to these areas with de-forestaton. We must stop this type of political game. Everybody knows the fact these smuggling groups fund the political leaders/parties. Unless the AP government go ahead ruthlessly to stop it, there is no other way. By auction government may get some money but it will not solve drought and deaths. perfectly captured, Mr Jeevan. these all are the results of the machinations of some of the diabolic politicians.instead of burying their faces in the sand with shame, they are vehemently out crying on AP. so if AP police capture some evil doers from TN, we should venerate them and give them some medals..this is what those TN leaders want! !